A Nest Amid Thorns: Bees!! For the past 4 or 5 months we've had a bees nest/hive in the back right corner of our back yard. It is in a bushy area that isn't frequented too much and our whole back yard is fenced in, which provides more privacy. 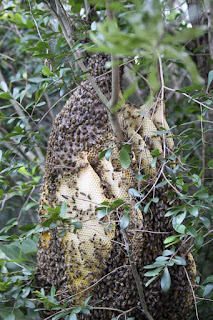 Right from the start we made sure these were not "killer" or Africanized bees. 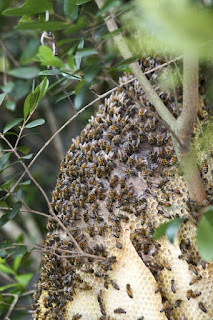 We can stand within a foot or two of the hive - really. The bees just go on doing bee things - very busy bee things. My husband has all he can do not to reach out quickly and grab some honeycomb - which would be dumb for a whole gamut of reasons. Of course, the bees would get angry and would attack, but he might grab a part of the comb (still covered with many bees - ouch) that has babies in it. 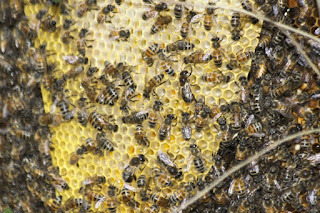 This is not tasty - you want the part of the comb that has honey in it. So he will not be giving into that urge to grab - I think he has enough survival instinct to protect him in this case. This is a shot where I attempt to show the whole hive, except the bottom is missing - so the next shot will show the bottom where all the bees "hang" out....literally. 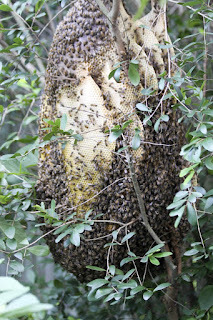 Here is the bottom of the hive - literally covered with bees. In the picture above, you can see the last of the gourd sticking out - and covered with bees. This entire hive is built around and hanging from a North Carolina gourd. We bought the gourd to house birds - but only bees have come twice now. This time the bees are covering the outside of the gourd with row upon row of honeycomb - the gourd is just the base. I have no idea if there are bees inside as well, since the opening is toward the back and I'm not going to squeeze myself back there - I am not THAT curious. Last - above is a closer up (yes, I meant to say "closer up") of the honeycomb. Maybe it's honey? Maybe it's capsules getting ready for babies. Who knows. I just feel honored that they live in my yard. Oh - and guess who hangs out UNDER the nest to eat any dead bees that fall. 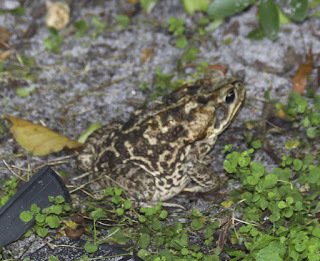 Mr. Cane Toad, a.k.a. Bufo toad.